In this edition of Right Here we meet the owners of Blazing Paddles, a new glass blowing studio in Macon. Jamie Adams raises the lid on a large container of molten glass. She dips a long metal rod in and gathers a round blob. She rolls it in tiny bits of orange and yellow. Once the glass is re-heated and shaped fellow artist Bryan Beck uses a small hose to blow air into it. Bryan and Jamie met in college and opened Blazing Paddles two months ago. Bryan moved to Macon from New Jersey after working with Jamie on the I Love Macon sculpture downtown. Besides selling their work they’re offering classes, mobile demonstrations and custom work. "If you're just focusing on one product or one idea you're going to run out of that pretty quickly and people are going to get a little bored. But that's why we're constantly coming up with ideas." Like a blown glass pumpkin patch this weekend at their studio Right Here on Napier Avenue. 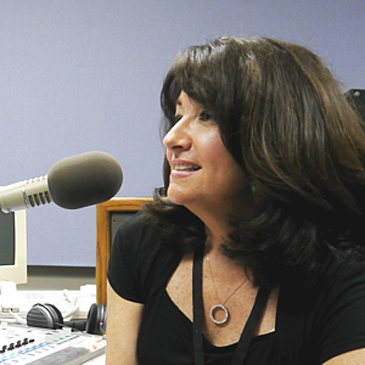 Josephine Bennett has been with GPB since 2006 and currently serves as the GPB Macon Station Manager and Senior Producer. Before that she hosted Morning Edition and served as Macon Bureau Chief and later Community Engagement Manager.